Polder 32 is a low-lying island in Bangladesh about the size of Manhattan. Its 40,000 inhabitants face an uncertain future because the land is gradually sinking beneath their feet while the level of the water around them is inching inexorably upward. 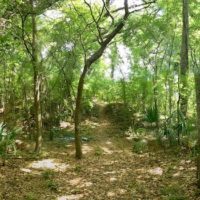 The problem, scientists have documented, is largely caused by longstanding, man-made changes to the landscape, changes that must be reconsidered as government officials look for ways to counter the effects of global warming in the region. “Previous flood control efforts have artificially pushed up local water levels by two to three centimeters per year in the last 50 years. This has put southwest Bangladesh ‘ahead of the curve’ on precisely the kinds of impacts that 10 percent of the world’s population – those who live in low-lying coastal areas – will face in the next 50 years,” said Steven Goodbred, associate professor of earth and environmental sciences at Vanderbilt University, who is leading a $7.5 million interdisciplinary study of coastal Bangladesh that is investigating the critical environmental and social conditions that influence human migration patterns in the area. Polder 32 is one of more than 100 islands in the southwest region of the delta formed by the Ganges and Brahmaputra rivers that are in similar circumstances: islands that support a total population of 20 million people. According to Goodbred and his colleagues, Polder 32 provides a valuable lesson for the government officials around the world who will be charged with taking action to counter the effects of global warming called for in the UN Framework Convention on Climate Change which was agreed upon in December in Lima, Peru. It also serves as a stark example of the unintended consequences that can occur when people adopt engineering solutions to control the physical environment without an adequate understanding of the impact of those solutions. The new research is described in a paper published online Jan. 5 in Nature Climate Change. Polder 32 is one of hundreds of low-lying islands located along the coastal plain of the Ganges-Brahmaputra delta. The area is whipped by cyclones in the spring and fall that drive surges of saltwater up from the Bay of Bengal. Summer brings monsoons that provide nearly 80 percent of the area’s annual rainfall and can cause extensive flooding. Digital elevation model of the lower Ganges-Brahmaputra delta in Bangladesh. Data show that much of the inland southwest poldered regional, noted in orange, is below local mean high water levels, making it susceptible to severe tidal flooding. Polder 32 is outlined in red. 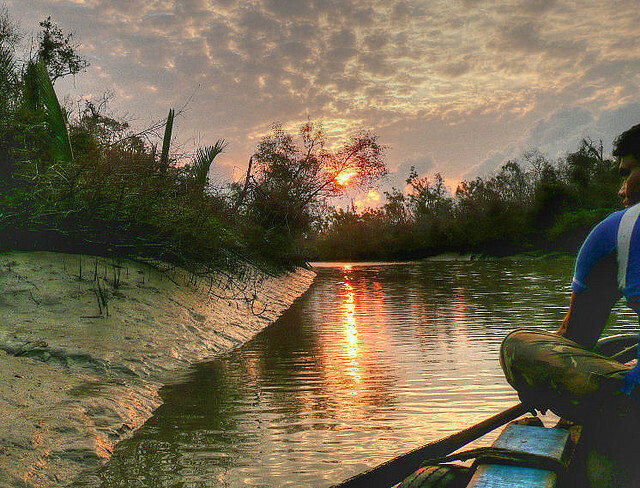 Originally, the islands were mangrove forest and swamp similar to the Sundarbans National Park, a UNESCO world heritage site just across from Polder 32, which is home to the world’s largest remaining mangrove forest and the world’s largest population of Bengal tigers. In response to severe flooding in 1954, 1955 and 1956, the United Nations came up with a plan to provide flood control and increase the amount of land available for rice cultivation by adopting the Dutch approach of building permanent embankments, or “polders,” around a number of these islands. In the 1960’s and 70’s, 5,000 kilometers of earthen embankments were constructed around 126 islands covering a total of 8,000 square kilometers (3,100 square miles). The embankment system continued to expand through the 1970s. Despite a number of problems, the system largely succeed in increasing food production and protecting the islands from storm surges, which encouraged more people to move to the still environmentally vulnerable islands. The restoration of democracy in 1991, which followed decades of turmoil after East Pakistan declared its independence from West Pakistan in 1971 and adopted the name Bangladesh, brought political stability that allowed the country to begin producing enough food to feed its population. However, its per capita income has remained exceptionally low and little of the new prosperity has flowed into the southwest region. In 2009, the southwest suffered a major setback when it was struck by Cyclone Aila, a tropical storm that breached island embankments, killing 330 people, leaving more than 8,000 missing and 1 million homeless. Polder 32’s entire population lost their homes and most of them had to live on bits of surviving high ground until the breaches were fully repaired two years later. When Goodbred and his colleagues began studying Polder 32, they were surprised to discover that the island elevation was 1 to 1.5 meters below the daily high water level, which is the elevation to which the natural mangrove landscape builds. This difference developed in just 50 years since the embankments had been built, accounting for 2-3 centimeters of elevation loss annually: five times faster than the background rate of sea-level rise. The researchers calculated that because the island was more than a meter below the local high water level, it was flooded by four times as much water as the adjacent Sundarbans, generating strong currents that scoured channels across the island and dumped large amounts on sediment on the landscape. It was also the reason why most of the island was inundated for almost 10 hours per day during the two-year repair period while the higher mangrove forest only flooded for about two hours during spring high tides. 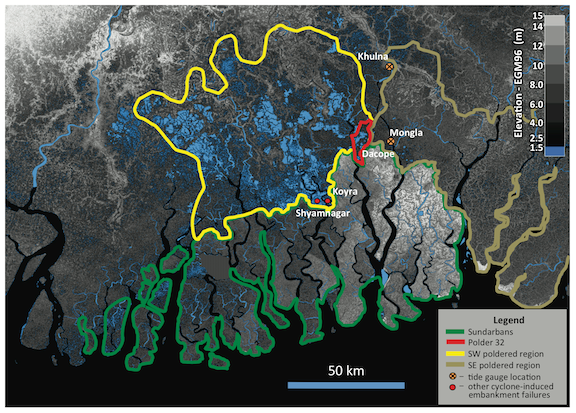 The researchers determined that the elevation of the Sundarbans – and that of other islands in the area that have not been protected by a man-made barrier – is dynamically maintained by the regular deposition of river sediment delivered 150 kilometers away during the monsoons and transported back onshore by the tides. The embankments cut off Polder 32 and most of the other polders from this source of material: a conclusion that was confirmed when core samples taken on the island revealed that the flood waters deposited an average of 37 centimeters of new soil during the two years before embankments were repaired. The researchers identified another major factor that contributed significantly to the island’s rapid elevation loss: cutting down the mangrove forests to clear land for farming and to use as fuel. The volume of the trees’ extensive root system was great enough to drop the surface level by 20 centimeters while compaction of the desiccated soils that were left accounted for another 40 centimeter decline. The soil subsidence problem was compounded by an equally dramatic rise in the level of the surrounding water. In the 50 years since the islands were impounded, mean high water marks have risen by nearly a meter. However, the researchers found sea level rise is a secondary problem compared to the impact of the embankments, which drove up water levels by restricting the places where water could flow. The minor role that global sea level rise has played calls into question the efforts by Bangladeshi officials to portray their country as a victim of global climate change to secure additional international development aid, a perspective that has been echoed uncritically in the American media. 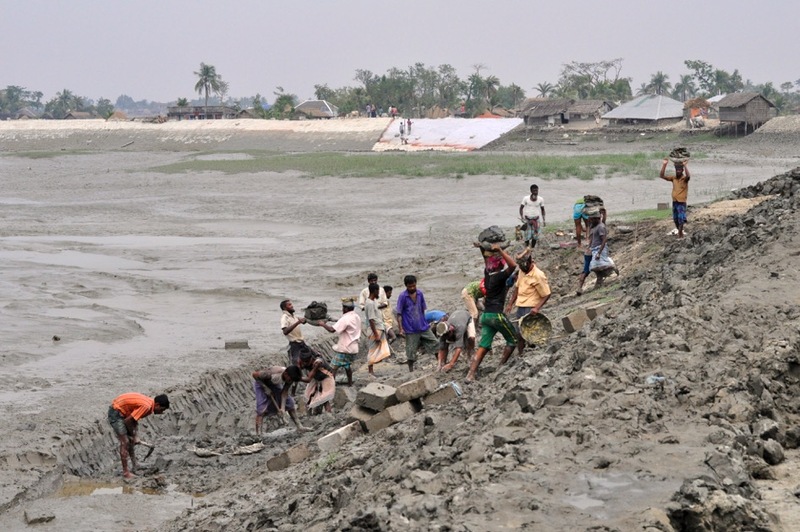 An example is an article titled “Borrowed Time on Disappearing Land: Facing Rising Seas, Bangladesh Confronts the Consequences of Climate Change” that appeared in the New York Times last March. “The problem with the article is that it totally glossed over the contributions that the previous human modifications to the environment have on the situation,” said Auerbach. This lesson is particularly important because the World Bank has just announced it is investing $400 million to rehabilitate embankments on 17 islands. If the new project simply rebuilds and reinforces the existing embankments, it is certain to cause problems in the future, the researchers cautioned. Although they don’t have a specific set of recommendations, they agree that adapting some version of the native practice of impounding the islands for eight months during the dry season to protect them from the cyclones and saline waters, and then breaching the walls during the monsoons so the fresh, sediment-laden river water can wash away the salt that builds up and deposit new soil is the preferable approach. “The silver lining is that each year the Ganges-Brahmaputra River delivers enough sediment to the delta that it can keep up with global sea level rise for several decades, if it is managed properly,” said Goodbred. “There are many low-lying deltas including the Mississippi delta that don’t have this ability because they receive only a fraction of their normal sediment load due to all the dams that have been constructed upriver. Bangladesh remains blessed in this regard, and there is hope for its future,” Gilligan added. Dhiman R. Mondal at the City University of New York, Vanderbilt Post-doctoral Scholar Carol Wilson, K. R. Ahmed and K. Roy at Khulna University in Bangladesh, Michael S. Steckler and Christopher Small at Lamont-Doherty Earth Observatory and Brooke Ackerly, associate professor of political science at Vanderbilt also contributed to the study. The research was funded by Office of Naval Research grant N00014-11-1-0683 and National Science Foundation-Belmont Forum No. 1342946.